It seems like light years ago when Star Wars: The Force Awakens was first announced, after Disney purchased LucasFilm for $4 billion in October 2012. In the three years that followed between then and the December release of the movie, countless rumors sprouted up through dark corners of the web, revealing numerous details about the movie. Most of these rumors were patently false, but some were completely accurate. One in particular was originally true, before changes were made to the script, according to Mark Hamill. One of the earliest rumors to surface regarding The Force Awakens revealed the opening moments of the film, which follows a lightsaber with a severed hand attached to it, that falls through the sky, landing on the desert planet of Jakku. Numerous variations of this rumor later surfaced, with one version claiming that both Rey (Daisy Ridley) and Finn (John Boyega) were the ones who found this Jedi weapon. The Sun recently spoke with Mark Hamill, who revealed that the original rumor was true, and that report revealed the first 15 minutes "absolutely accurately." "When I first started reading... I won't name the websites, you'd read the leaks and go, 'That's rich.' They were so wrong, and then, one day I read the first 15 minutes of the film absolutely accurately. I can tell you now that in the original opening shot of seven, the first thing that came into frame was a hand with a lightsaber, a severed hand that enters the atmosphere, and then the hand and bone burns away and goes sticking into the surface of Jakku, the desert planet that Rey lives on, Daisy Ridley's character. And this alien hand comes in, don't know if it was Maz, but it was an alien hand who takes the lightsaber [a]way, and then the movie proceeds as you see it." It isn't known at what point in the pre-production or the production process that the opening was changed, but it was believed that the lightsaber belonged to Luke Skywalker, and held the key to finding his mysterious location. We also don't know why this scene was taken out, but it would have likely lead to a lot of questions from fans, including where this severed hand and lightsaber has been for the past 30 years or so, and why did it land on Jakku right then and there? 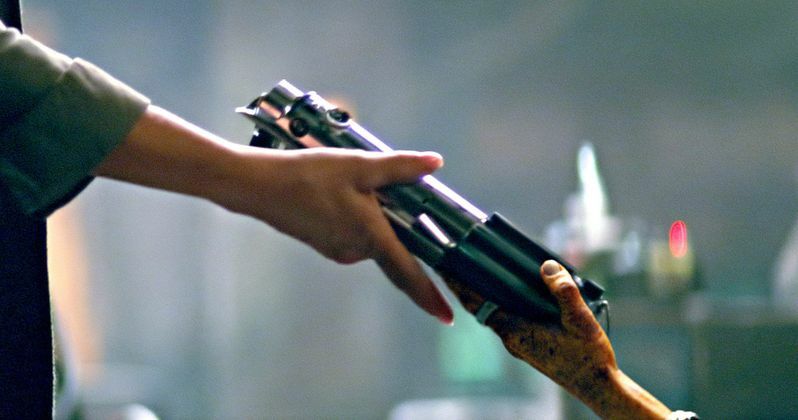 Regardless, the movie eventually revealed that Maz Kanata (Lupita Nyong'o) was in possession of Luke's lightsaber, which she then gave to Rey, which caused her to have a unique vision. There were so many rumors that surfaced before The Force Awakens hit theaters in December, but another one that was proven to be true revealed that Han Solo (Harrison Ford) would eventually be killed by Kylo Ren (Harrison Ford), his own son. Production is currently under way on Star Wars: Episode VIII, under the direction of Rian Johnson, who recently revealed that production is already halfway complete. We still have more than a year and a half left until that sequel hits theaters, and we'll be sure to keep you posted with all the latest rumors and details swirling around this movie. In the meantime, take a look at Mark Hamill's video interview below.